From the capital of Phnom Penh to the small villages along the Mekong, the many children of Cambodia are symbolic of a country recovering from tragedy and blossoming. Like a homing beacon, it starts, softly at first. It builds and builds, louder, until it’s right in front of you. But this isn’t a beacon. This is a Cambodian child waving from the shores of the Mekong River with a big smile that would melt even the blackest heart. And, like the hundreds of children we encounter, who yell that one English word in succession — perhaps the only English word they know — they’re not trying to sell anything. They’re just happy to see you. From the capital of Phnom Penh to the small villages along the Mekong, throughout Cambodia and most of the small part of Vietnam we visit, the children — and there are lots of them — are symbolic of two countries recovering from tragedy and blossoming. Cruising along the Mekong, particularly in a gorgeous colonial-style Pandaw Cruises boat — organised by Wendy Wu Tours — is a particularly lovely way to see both countries. It all starts in Siem Reap, the north-western Cambodian town that’s the gateway to the ruins of Angkor. The flight from Kuala Lumpur arrives in the early afternoon, allowing 24 hours in the historic town before we board our river ship for the cruise down the Mekong. The beautiful colonial-style Victoria Angkor Resort and Spa is our base, and a five-minute tuktuk journey takes us into town. The crowds at Angkor Wat greet the sunrise. Nick Sas. RV Mekong Pandaw, plus horse. A cow peeks out from beneath a house in the village of Angkor Ban. A praying monk in Krek. Stairs to the top of Angkor Wat. It is touristy, no doubt about that, and the trip the next morning to the jewel of the temples, Angkor Wat, confirms that. In-between the bars that sell US50¢ lager along the winding alleyways, Siem Reap has a decent mix of touristy and, shall we say, “genuine” shops. A sunset cocktail at the famous Foreign Correspondents Club — and a traditional Cambodian amok curry for dinner — before a walk around the bustling night market is a good segue into Cambodian life. But most people go to Siem Reap for one thing: the temples. An early night is in order so we’re ready to wake up at dawn: the best time to see the ancient landmark, before the heat sets in. The early morning crowds are insane but there is no denying Angkor Wat’s beauty. A quick tour of the Bayon temple, known as the temple of the faces, and after four hours — more than enough time — we are back to the hotel before the five-hour coach transfer to Kampong Cham. Our ship, RV Mekong Pandaw, is waiting. Although long, the coach ride cuts through the heart of the country and across the swampy towns adjacent to massive Tonle Sap lake. Homes sit precariously on stilts atop the muddy plain and we even pass through the nondescript fishing town which was home to Cambodia’s diabolical former leader Pol Pot. After a few stops, including a 20-minute break at a delightful little stonemason’s shop on the side of the road, we arrive at Kampong Cham and get a first glimpse of our ship. And what a beauty she is. Built in 2002, the RV Mekong holds 48 people — but luckily we have only 13 aboard for our first stint, so we’re treated like Cambodian royalty. The 60m ship has 24 rooms, all with French doors and a beautiful teak finish, as well as a gym, day spa, cinema (where nightly Cambodian and Vietnamese films are screened), a spacious dining room and bar. But the piece de resistance is the upper deck, an enormous 750sqm statement that runs along the whole boat. It is impressive, and later becomes my base camp to read a book, relax with a drink and watch the world pass by. The friendly staff settle us in for our first night and we later experience our first meal — one of many that will leave me worried I’ll return home with a new waist size, the food is that good. The days on RV Mekong Pandaw are relaxed, as any good cruise should be, but with a subtle structure. Wake up, eat an amazing breakfast, morning excursion, come back, relax, lunch, relax, afternoon excursion, come back, relax, cocktail hour, dinner, movie — or free time — and sleep. It is the type of routine you can get very used to, particularly with such accommodating and friendly staff. The twice-daily excursions are, for the most part, well thought out and interesting. 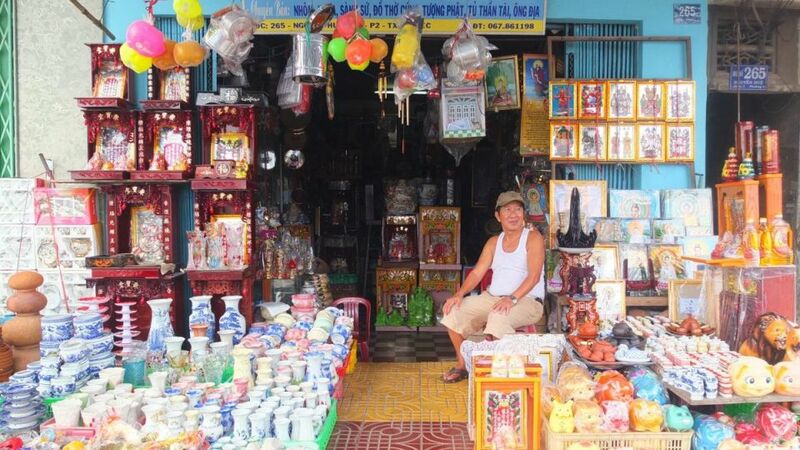 Our first is one of the best: a tour of the French colonial town of Kratie. The friendly locals — who, judging from the looks on their faces, don’t see westerners often — are very welcoming, with children waving and shouting their now-ubiquitous chant of “hello, hello, hello”. One local invites us into her front yard where, among the roaming free-range chickens, she cooks traditional Cambodian green bean cakes. A walk through the market, where my feet get covered in mud and my nose cops some “interesting” odours (meat is left on tables in the sun), is another highlight. The market, like many in Asia, is a hive of activity — families go every day because they don’t have refrigerators. Seeing the cave monastery of Wat Preah Angkoak and, on day three, a walk through Angkor Ban village to visit the children at the local English class, are other highlights. There are a few excursions that don’t quite hit the mark: being from Perth, a four-hour round trip to watch river dolphins near Kratie is like a guide giving a tour of your own house. And a walk through the silver village of Krek is the only time in the whole cruise where I feel hassled, like on the streets of Phnom Penh, to buy something. Speaking of Phnom Penh, day four is a 24-stopover in Cambodia’s capital. It is getting big quickly and won’t be sleepy for too much longer. The stock- standard walk around the Royal Palace and museum after a cyclo into town is about as touristy as you can get — but it is still worthwhile. For anyone who hasn’t been before, the Killing Fields and the Genocide Museum are must-sees. They’re a sobering reminder of human tragedy and a period of history that is still so raw for Cambodian people. Every person in the country was affected somehow and these two places do a tasteful job of remembering them. “Good morning Vietnam!” I shout to my bemused fellow passengers when we awake in the quasi-communist state on day six. Our first day in Vietnam takes us to Chau Doc, an odd Muslim town where we are drenched by a typical afternoon tropical storm. A walk through the incredibly authentic and very pretty town of Sa Dec — which inspired the novel and film The Lover — and later a look at the Cai Be district, and its family food producers, are great insights into the Vietnamese way of life. A performance from local musicians and some very liberal vodka pouring from the staff mean a vicious hangover greets my final morning on RV Mekong Pandaw. After saying our goodbyes, and already missing the “five-star-plus-plus” service, I prepare myself for our bus ride to Ho Chi Minh City to take in the hustle and bustle of the Vietnamese capital. Wendy Wu Tours’ eight-day Classic Mekong independent river cruise aboard RV Mekong Pandaw travels from Siem Reap to Ho Chi Minh City (and in reverse). Priced from $3755 per person twin share, it includes meals and house beverages, sightseeing, coach transfers and gratuities. Other options include a three- night cruise or a 20-day Mekong Odyssey escorted group tour, which includes a seven- night Pandaw cruise from $9190 ex-Perth. wendywutours.com.au and travel agents. Malaysia Airlines flies daily between Perth and Kuala Lumpur. malaysiaairlines.com and travel agents. Nick Sas was a guest of Wendy Wu Tours and Malaysia Airlines.